When running any sort of physical production based business, you will often have stock on hand. Instead of only stocking for a short time, there will be a “backup” supply of products that can be called upon as demand changes. This is known as “just in case” manufacturing and is highly common in most industries. 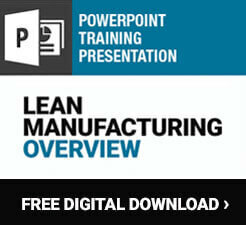 However, several decades ago, the rise of lean business gave way to the concept of “just in time” manufacturing. In a just in time, or JIT, system, products are made as they are demanded and there is little to (ideally) no back-stock at any time. The idea behind JIT manufacturing is that one can eliminate several kinds of waste by taking away the need to keep inventory of excess stock. From now on, equate “stock” to “excess stock” or the concept of having too much on hand, because in a JIT environment “stock” doesn’t really exist outside of individual orders. When you don’t have to keep inventory, employees free up their time for other projects and tasks. Also, you have less paperwork to manage, and can focus on other things, like workplace safety, new profitability angles and marketing strategies, etc. Another reason to go to a JIT model is that you increase accountability of management. Because you have no inventory to fall back on in a JIT situation, inventory cannot be used as a crutch to make up for other problems. Slow, inefficient production is often masked by a stockpile of inventory, making it harder to realize certain areas of production may need improvement – these may include machine functionality, worker habits, reliability, and inadequate space management. Another huge place you save by adopting this method is in transportation. Materials do not need to be stocked at various sites and you need to do much less transporting. You will eliminate time wasted in transit when there is traffic or road congestion, and you’ll even be more environmentally friendly by reducing fuel burned for shipping purposes. When changing to a JIT system, there are going to be some immediate changes and a lot of managerial fallout to deal with as you go along. Re-training is a huge part of this because your workers have been used to a certain system for likely years leading up to the switch. Your first step is to design your new process. Map out what it will look like and where your biggest changes will have to come in. Will some employees need to be moved to different parts of production? Can certain operations be combined/consolidated? Next you need to implement your system with close, total quality control. Watch and monitor everything, especially at first. JIT businesses can get into trouble if they aren’t actively managed because of the slim (but efficient, remember?) inventory and timelines they work on. Finally, improve. Revise. JIT is about getting production efficiency down to a science, so keep trying new tweaks until you hit that perfect balance. Active engagement now will mean bigger payoffs in saved time and reduced costs down the road.